Version 2 of the DigitalOcean API includes many changes that improve the experience for everybody. 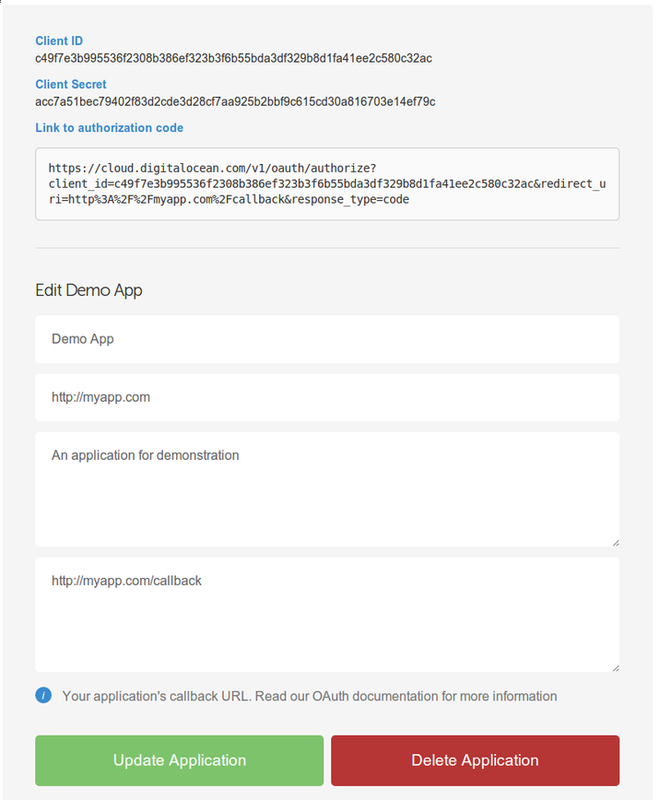 One of the most important new features is OAuth authentication for users and applications. The OAuth system allows you to authenticate with your account using the API. This access can be granted in the form of personal access tokens for straight-forward use cases, but it also allows flexibility in allowing applications to access your account. In this guide, we will discuss how grant or revoke an application's ability to access to your account. We will also discuss the other side of the interaction by walking through how to register applications that leverage the API with DigitalOcean. This will allow you to use OAuth to request access to your users' accounts. If you are simply interested in giving applications access to your account, you will be able to grant authorization through the application and revoke access through the DigitalOcean control panel. When using an application that utilizes DigitalOcean's OAuth authentication, you will be redirected to a page to choose whether you would like to grant the application access to your DigitalOcean account. The request will define whether the application is requesting read-only access, or read & write access. If you decide to grant the requested access, you will be returned to the application, which will now authenticate to operate on your account. Under the "Authorized Applications" section, you should see an entry for each of the applications you have granted access. The application will no longer have access to your account. To utilize OAuth as a developer, you need to go through two separate processes. First, you must register your application to gain the credentials necessary to request access. Afterwards, you must develop your application to correctly make requests and handle the responses from both the user's browser and the DigitalOcean servers. If you are a developer needing to authenticate users through OAuth, you first need to register your application through the DigitalOcean control panel. You will be taken to the registration page. Here, you will need to supply some basic information like your application's name and homepage, and provide a brief description. Keep in mind that this information will show up on the authorization request page for users. 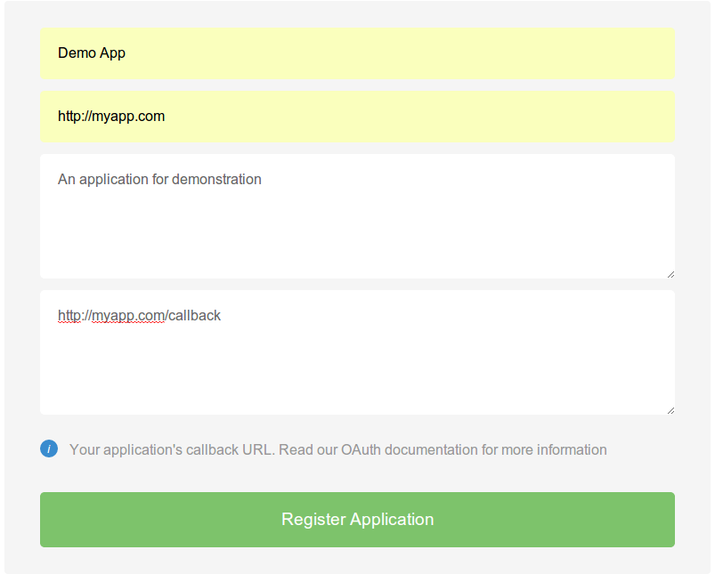 You will also need to supply a callback URL for the application. This is a location where you will configured your application to handle authorization responses. See the next section, or the OAuth Authentication guide, to learn more about what is necessary to process an OAuth request. When the user is redirected to your supplied callback URL after granting access, a code that you need to capture will be included as a query parameter. You can then use the AUTH_TOKEN in subsequent requests to take actions on the user's account. Most developers will leverage an OAuth library for their language of choice to make this process simpler, but it is always good to have a general idea of what is happening behind the scenes. (no scope) Defaults to read scope. read Grants read-only access to user account. This allows actions that can be requested using the GET and HEAD methods. read write Grants read/write access to user account, i.e. full access. This allows actions that can be requested using the DELETE, PUT, and POST methods, in addition to the actions allowed by the read scope. Since DigitalOcean uses Ruby internally, we are providing an open source OAuth strategy for the community to use. The omniauth-digitalocean gem is on Github and published to RubyGems. It’s based on OmniAuth, the widely used Rack-based library for multi-provider authentication, and is an easy way to integrate “sign in with DigitalOcean" into Rails and Rack frameworks. OAuth is a well established way of granting applications access to your account or requesting account access from users. The DigitalOcean "Apps & API" page strives to make this process as straight-forward as possible for both parties. For a technical overview of DigitalOcean's OAuth API, click here: DigitalOcean OAuth Overview. To learn more about how OAuth works, check out our community article: An Introduction to OAuth 2.